The FlyDry is a robot that can dry every part of the vehicle; it is normally installed inside multiple prep stalls, for body filler and primer and also inside spray booths for waterborne and clear. cally in every position – top and down – covering every angle of the vehicle’s profile. 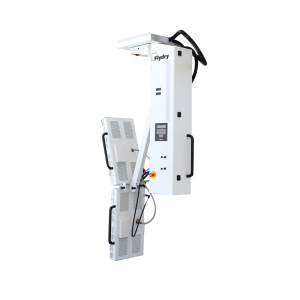 The robot dries the parts involved in the treatment without a length and height limitation, using electric infrared. This is because the drying is done from the movement of the robot all along the vehicle’s surface to dry. The only limitation is the working stall’s length and width. 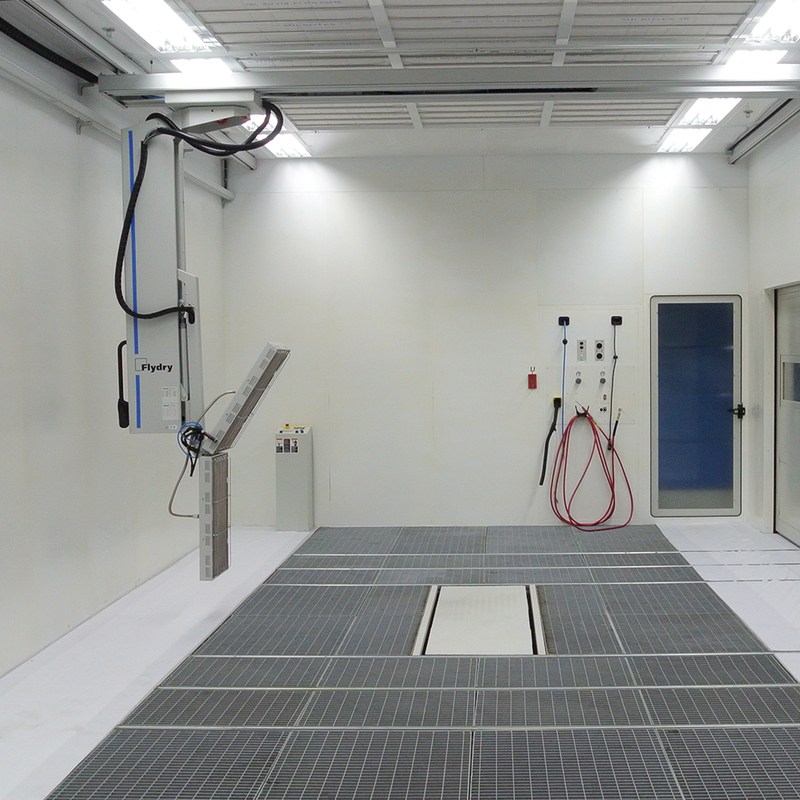 The FlyDry robot has a built-in database of formulas for drying any automotive paint manufacturer’s waterborne/solvent basecoat and clear coat systems. The technician selects the brand and paint system to be applied. 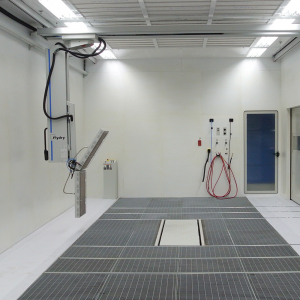 The robot then automatically manages the drying treatment for distance, color, paint thickness and climate. The automatic adjustment and control of the treatment are based on a built-in laser that constantly reads the quality of the drying process. 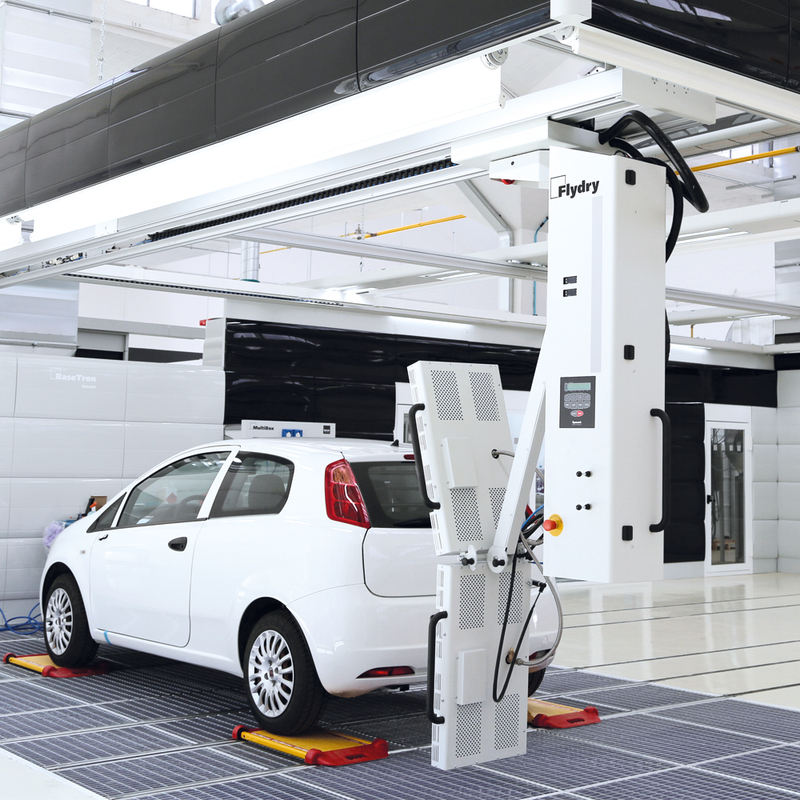 The FlyDry is available in two different models: one is for normal-size vehicles and the second one is for commercial vehicles; one robot can be used in up to four working stalls. 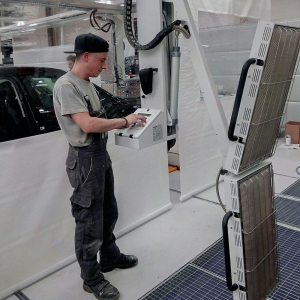 In new projects, Symach typically installs multiple FlyDry units: inside body stalls for body filler, inside the conveyor for primer, inside the FixStation, and in the booth for one panel repairs, for preparation and paint. The FlyDry robot dries every brand of paint, primer and body filler. 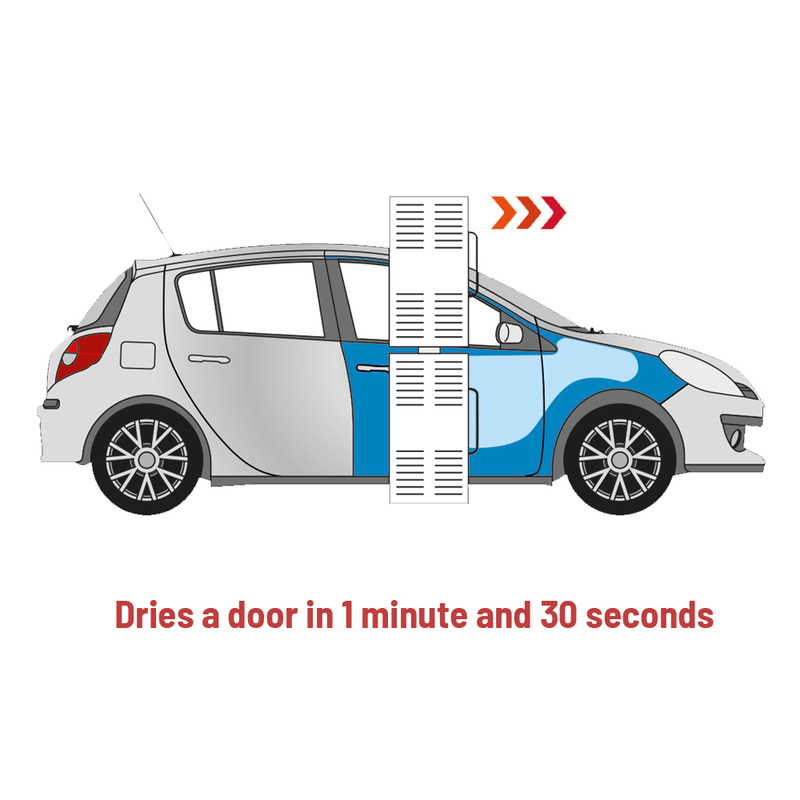 The drying speed is approximately 80 cm or 32 inches per minute; for example, it dries the length of a vehicle’s door in less than two minutes. Compared to the electric infrared, it is seven times faster. 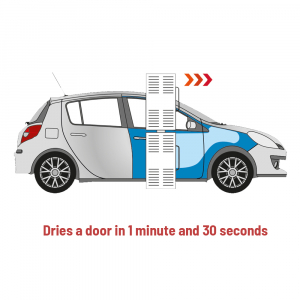 The FlyDry dries with a performance that is about seven times faster than other infrareds on the market because the FlyDry is a robot that dries the paint moving along the surface of the car. The drying time is measured in centimeters or feet per minute. 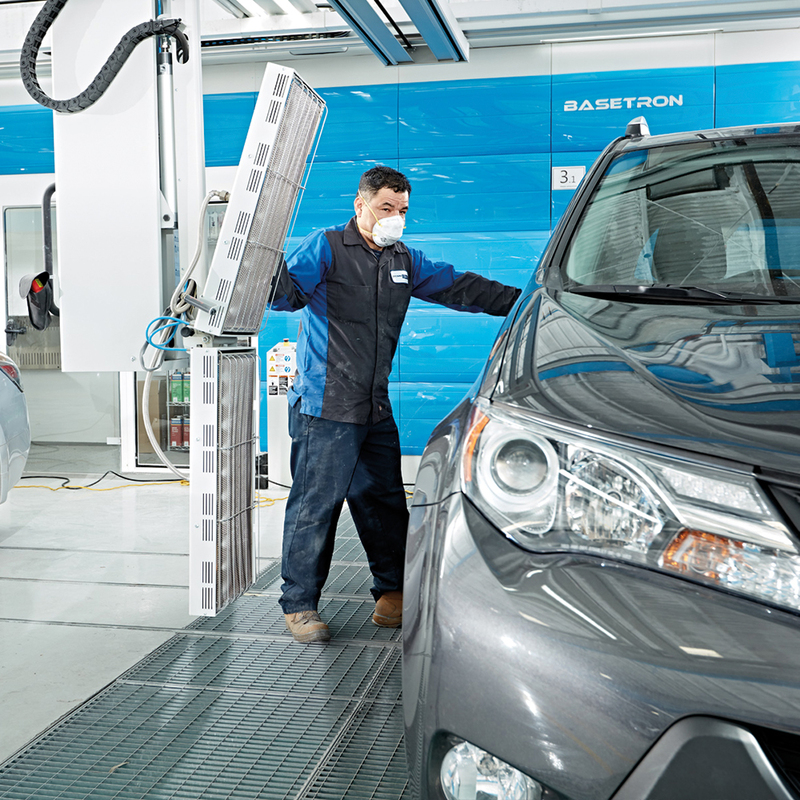 Depending if the technician uses the hardener – fast, standard or slow – the drying time is: Body filler / from 100 cm or 39 “ per minute, to 80 cm or 32 ” per minute. Primer / from 90 cm or 35 ” per minute, to 70 cm to 27 ” per minute. Waterborne / from 120 cm or 47 ” per minute, to 80 cm or 32 ” per minute. Clear / from 90 cm or 35 ” per minute, to 60 cm to 24 ” per minute. “Drying Control Quality” during all phases of drying treatment, adjusting the intensity and quantity of DryTronic waves to meet the parameters of the drying formula. 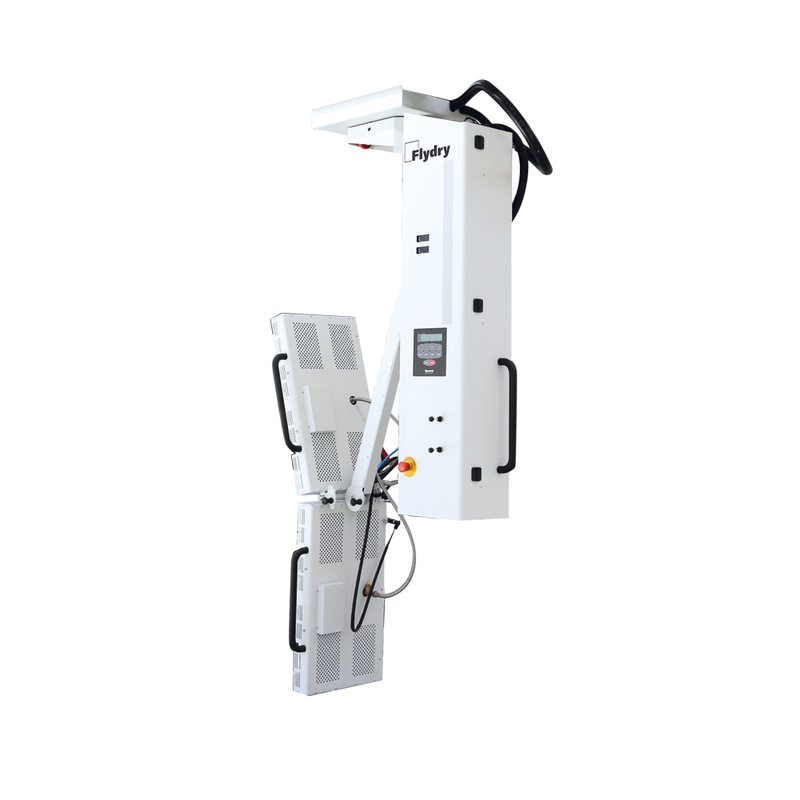 The crane of the FlyDry is the support of the column and moves along the working stall with three aluminum rails: two on the side and a central one. The column slides within the overhead crane along the width and length of the working stalls. The FlyDry is equipped with an independent set of rails, for every working stall, up to a maximum of four working stalls. the drying treatment. The two lamps can be moved from a fully‑vertical to a fully-horizontal position and be set at varying angles. 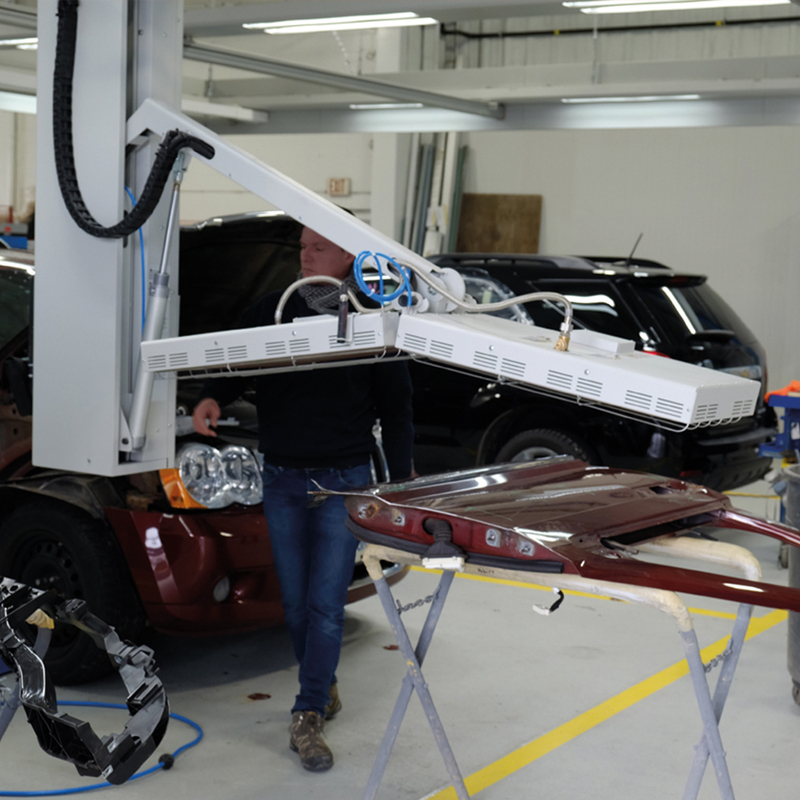 In this way, the two lamps can be positioned in the ideal position parallel to vehicle surface for perfect drying. The column is produced in two versions, one for normal‑size vehicles and one for commercial vehicles. The one for cars covers the height from 2,7 m to 3,1 m or from 106 ” to 122 ”. 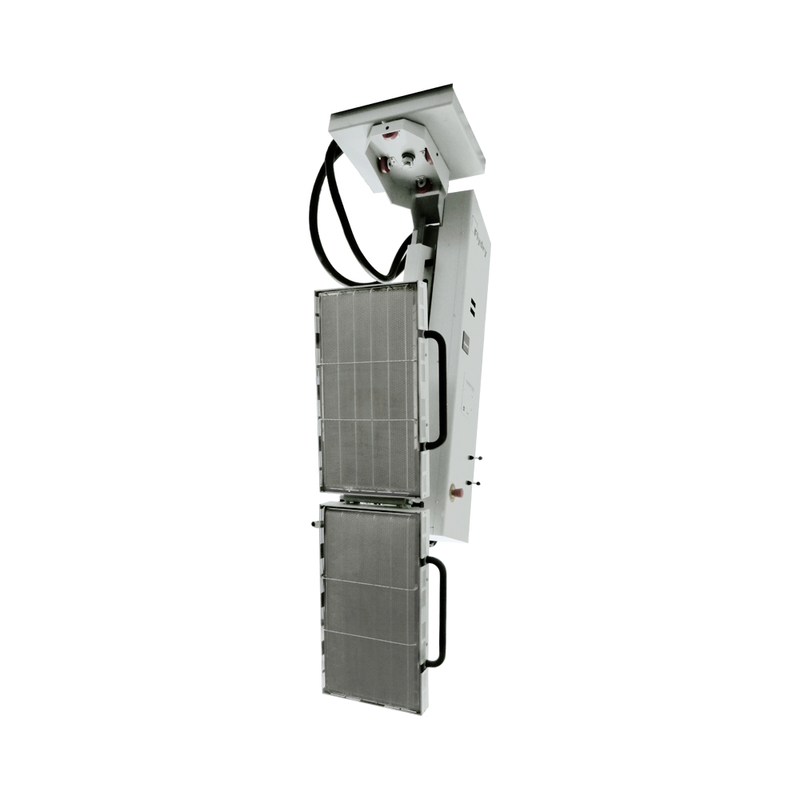 The one for commercial vehicles covers the height from 3,2 m to 3,5 m or from 125 ” to 137 ”. 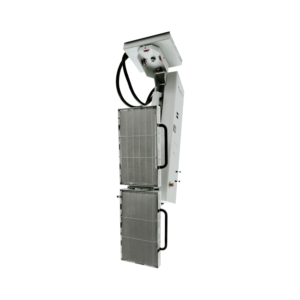 Every group of DryTronic radiant panels has an LDC (Laser Drying Control) for dynamic drying control. The laser reads the quality of drying then transmits the data to the computer, which then modifies the quantity of electromagnetic waves to meet the correct drying needs if necessary. The drying treatment is always influenced by the distance of the lamp from the vehicle, the thickness of paint applied, the color of paint, the type of substrate material and differences in climate. For all these reasons, the LDC automatically adjusts the intensity of the radiant waves to meet the correct quality of drying. depending on the surface of the painted vehicle. The DryTronic radiant panel generates energy using a catalytic chemical reaction (without fire and combustion). This reaction is achieved by using a catalyzer, which breaks down the gas molecule and separates hydrogen from carbon. The carbon is not used; instead, when the hydrogen reaches the lamp’s outer surface and comes in contact with oxygen it generates electromagnetic waves. Symach’s patented technology manages the wave’s length and adjusts to the exact wave’s range. This allows it to dry paint in 30-50 seconds. 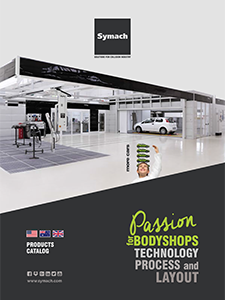 > More information is available in the technology catalog.